A new development will be coming soon to the corner of Confedration Pkwy and Burnhamthorpe by two partners Urban Capital Property Group and Rogers Real Estate are creating a new neighbourhood the focus will be on unique designs to add to downtown Missisauga’s expanding skyline. Its not an everyday thing to have the opportunity to create and build a master-planned community where everything from building architecture to landscaped pathways and open spaces are designed to integrate seamlessly with the surroundings and culture. The project was announced by in September 27 2016 by Mississauga Mayor Bonnie Crombie and Edward Rogers. The six-hectare parcel of land was originally purchased in 1960 for a radio transmitter at a cost of $170,000 and the project has been in the works since 2007. The telecomunication transmitter is now located on the CN Tower. CORE Architects are the architects and Cecconi Simone are the interior designers. The family of telecom and media mogul announced plans for a $1.5 billion real-estate development in downtown. With an emphasis on modern designs, contemporary architecture and refined lifestyle amenities. It will be located at the south west corner of Burnhamthorpe and Confederation just minutes from this vibrant centre - a 10 residential tower that will have Studios, 1 bedroom and 1 bedroom plus den units, 2 bedroom and 2 bedroom plus den units, 3 bedroom units and townhomes and which will also feature more than two acres of parkland (New public parks with European style outdoor patio spaces) with frontage on Burnhamthorpe Road. At this time the developers and designers are in the process of finalizing the floor plans and pricing. We are currently accepting registrations for those wishing to be contacted for our preview opening. Bring your guests directly from the Lobby to the Party Room Lounge to gather around, celebrate and toast. Some of the amenities that this master-planned project will be offering are main Lobby with Concierge, Party Room Lounge, Servery, Party Room Dining, Indoor Bar, Outdoor Bar, Outdoor Lounge and Fireplace, Fitness Centre, Children’s Playroom, Dog Wash Day, Mail Room and Elevators. The pre-construction of M City will continue the telecom's company long history. In the 1960s, Ted purchased 43 hectares of farmland on which to locate transmitters for one of his first business ventures, radio station CHFI. The plans allow for 6,000 units for rent or sale, ranging in price from $200,000 to $700,000 with the first phase of construction beginning in late 2017 or earlier 2018 and continue in stages over the next decade. The first tower is expected to make an iconic addition to the skyline with 51 undulating stories and 700 units which will go up for sale in Spring 2017. The Master Plan outlines a guide to ensure everyone who will live and work in the downtown area - residents, landowners and developers - has their say as a new planning framework for downtown is developed. CORE Architects, which built the College Condominium at 297 College, won a major design competition for College. It remains to be seen whether the city can learn from Toronto’s mistakes, from building up its waterfront, or debates about the need for light rail transit. We can say this is a new and exciting venture but there are a few drawbacks when it comes to this kind of venture, the relationship between the people, developers, and local residents is vital. The telecom company provided to the community outlining all the info on the 10-tower where Burnhamthorpe Road meets Confederation Parkway. The site is the last piece of undeveloped land in the area. The towers go as high as 21 to 30 floors up to 51 to 60 floors. Podiums will be three to six storeys. The downtown core will have many walkable streets to shop and eat at many different restaurants in the area. It consist of many beautiful places like public squares, parks and outdoor food markets, also an entertainment district and a vast majority of big venues to experience arts and culture that make the area a wonderful place to live and work and shop. All this will be available to residents and visitors, as well as people who are going to be working in downtown. Going downtown will be faster - an expanded collection of bike paths and much improved transit will move you in and around and at the same time providing the best connections that employees and businesses are looking for right across the Greater Toronto Area. M City Condos is a 10-tower, 15-acre, 4.3 million sq. ft. master planned community, Ontario which will include more than two-acres of public parkland in the downtown core. Brought to life by the Downtown21 Master Plan, the developers with great pride announces this new development as the first major residential venture from the family. The carefully planned project has been in the planning stages since 2007, when they got the assistance from renowned Canadian developer Urban Capital Property Group to oversee the process of turning a long held family asset into a legacy. A 15-acre plot of land that has been vacant on the south side of Burnhamthorpe Road is finally going to be changed into a $1.5 billion dollar . The site was to be used for a radio transmitter, the property which is owned by the family through Rogers Real Estate, will be constructed over the next 5 to 10 years that will include 4.3 million square feet of space spread across 10 towers, podiums, and townhome rows. Brand new developers will be team up with veteran developers Urban Capital to construct this new project. While the blueprint of the site designed by Cooper Robertson of New York is not final, the different shapes of the buildings shown on the site plan should be considered just a sketch. The northeast corner of the proposed site which will be the first to be constructed, with an amazing 51-storey tower designed by Core Architects. The building, which duplicates one of seven different floor plans as it rises, was the winner of a private competition between three high-profile Canadian architectural firms, and is meant to be the first of many unique designs to come from for the rest of the development. The future is about enjoying today. This is where enjoying the day will start at Burnamthorpe and Confederation Pkwy. Mary Fix Creek Gateway combines green spaces with a family neighbourhood feel, all in one place. This new neighbourhood is about bringing family, friends and neighbours closer, and also with a major mall such as Square One, Sheridan College, banks and libraries a walk away, commercial and public amenities are all within walking distance. Culture, character and personality are all attributes of a great community. New residents can find the best of it at the nearby public places such as the Civic Centre, Celebration Square and the Living Arts Centre. Also when the need for travel comes up for work or pleasure, residents have transportation all around them. Choices they will have are the GO, Transit or bike paths, all are convenient and readily available. Its poised to create a dynamic public realm designed to add a new cultural feeling to the thriving ever changing population, while providing its residents with the things it needs future growth. The future is set on connectivity, character and growth. M City features will include extending existing streets on a unique line to create a network of street blocks, creating a pedestrian-friendly environment. Typical residential blocks will provide two-way roads with on-street parking and large sidewalks. 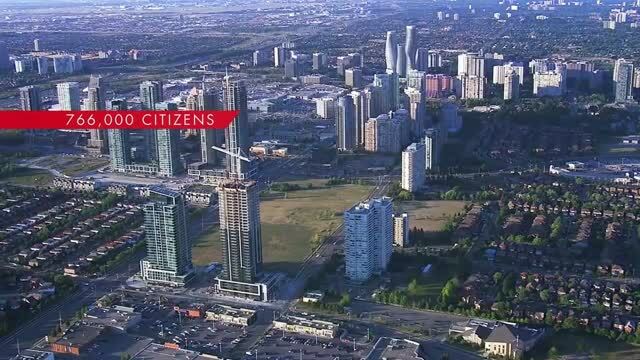 The proposal by Rogers Communications are consistent with Mississauga’s commitment to build a livable, walkable, home to multicultural residents and commercial spaces that will be connected to a new and expanded transit network. The community will be within walking distance of the planned LRT and infrastructure upgrades will help to accommodate the 15,000 residents who will call home. It is designed to fit into Downtown `21 strategy to make the core more vibrant and resident-friendly. Urban Capital Property Group is also launching 2 other pre-construction sites, one in West Don Lands called Harris Square Condos and the other project in Etobicoke called The Queensway Condos. These new place will have sections that will focus on higher end, luxury embedded units which will provide a new standard for higher end living in the core of Canada’s sixth largest city. Rogers Real Estate Development Ltd. will own and develop the project. It has recruited New York-based Cooper Robertson to design the framework for M City and Canadian developer Urban Capital to oversee the process. The family has partnered with a very well known developer to manage the first phase. The history of Urban Capital, the company started out with a 48-unit Camden Lofts back in 1996. Organic living and raw space is what is was all about. Camden was borne out of a belief that the cities could come alive again as vibrant centres. Camden was followed by the 66-unit Charlotte Lofts, just across Spadina, and the first Ottawa development, the East Market. The East Market had 420 units, together we learned from Camden and Charlotte and brought that experience to our national capital, and found out that people who live in downtown Toronto also craved their open space living concept. Urban Capital is one of Canada’s leading developers with an award-winning reputation for architectural design, environmental sustainability and a loyalty to all major cites. Working together with the best architects, designers and planners, the company is widely recognized for bringing high-design concept living across Canada. Since the early days they have over 3,500 condominiums, with another 1,000 now under construction and many more in the pipeline, totaling over $2 billion in pre-construction. In 2003 they added Montreal to their portfolio, 2009 they brought Saucier + Perrotte Architectes to Toronto for their West Don Lands and in 2013 they expanded to Winnipeg and Halifax. Their work has pushed the envelope to be bolder, hip location, high-end designs and green living. Today they are continuing that boldness, with new markets, new architectural approaches, new interior features and layouts, and new environmental measures. They believe our living spaces should be liveable and practical. Interesting, impeccable, a little unusual. In 2007 Urban Capital and Rogers Real Estate Development Limited began a wonderful venture of taking a 15-acre site through master site plan approvals. Ten years later, Mississauga City Centre is launching this proposal. This future area will be defined by world-class architecture and technology, and a lively pedestrian experience with new parks and outdoor spaces. In Early 2017 this development will launch a bold new first tower by CORE Architects, winners of a design competition to redefine the skyline and set an exciting buzz for future phases. The amenity program by Cecconi-Simone will be equally impressive, featuring a 14,000 square foot amenity terrace with an outdoor pool and a ice skating rink. The telecom company has a long and positive history. They believe in the people and in the vision that was set forward in Downtown21. With the help of Urban Capital and our pre-construction team, we want to contribute to the growth of this new ever changing and growing downtown. This project will be anchored by iconic design, it will create public spaces and parkland, and offer residents the best technology available. New York-based artistic design firm Cooper Robertson was hired to design the framework for this wonderful master-planned community. Cooper Robertson partner Donald Clinton was the lead designer on the project.